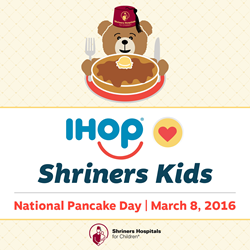 On March 8, Shriners Hospitals for Children® will join the International House of Pancakes (IHOP) in celebrating National Pancake Day. Guests will receive a free short stack of buttermilk pancakes. * With every short stack of pancakes served, diners will be encouraged to make a donation to designated charities, including Shriners Hospitals for Children. The IHOP restaurants that have chosen Shriners Hospitals for Children as the beneficiary of this event are predominately in Texas, with additional locations in Alabama, Arkansas, Colorado, Louisiana, Oklahoma and Wyoming. List of participating locations. “We hope to exceed $1 million in contributions during this year’s National Pancake Day, which will take place from 7 a.m. to 7 p.m.,” said Ken Flournoy, committee chairman and member of the Shriners Hospitals for Children — Houston Board of Governors. In addition to raising funds, the campaign generates tremendous awareness of Shriners Hospitals for Children, a pediatric health care system with 22 locations in the U.S., Canada and Mexico, including two hospitals in Texas. Founded by the Shriners International fraternity, Shriners Hospitals for Children provides advanced, specialized medical care to children, regardless of the families’ ability to pay for services. Since the first Shriners Hospital opened in 1922, more than 1.2 million children have benefited from our unique, compassionate approach to pediatric health care. By visiting your local IHOP restaurant on National Pancake Day, you will have the opportunity to enjoy delicious, free pancakes while joining Shriners Hospitals for Children’s important mission to provide both hope and healing to children and families. For a list of IHOP restaurants supporting Shriners Hospitals for Children, and to learn more about our health care system, please visit shrinershospitalsforchildren.org. Shriners Hospitals for Children is a health care system of 22 hospitals dedicated to improving the lives of children by providing state-of-the-art pediatric specialty care, innovative research, and outstanding teaching programs for medical professionals. Children up to age 18 with orthopaedic conditions, burns, spinal cord injuries, and cleft lip and palate are eligible for care, regardless of the families’ ability to pay. *Limit one free short stack per guest. Valid for dine-in orders only. Not valid with any other offer, special, coupon or discount. Valid at participating restaurants only, while supplies last.